The images slid past as the Trello demonstration continued. As it came to a close, my editor-in-chief, Katie, and I made eye contact. We both had furrowed brows and scrunched noses. Finally, Katie said what I was thinking. Katie and I are both pen-and-paper kind of girls. We like jotting down our notes so we can remember them better. We like the feeling of flipping the paper over and drawing a line through the things we have accomplished. The digital organizer was missing that. We brainstormed ideas and spent lots of time determining the possible flaws in each plan. Staff personality is always a major factor. We understand that not everyone prefers tangible over digital. However, we also understand that our staffs always seem to struggle with communication, so we needed something so clear and simple that it would not fail. 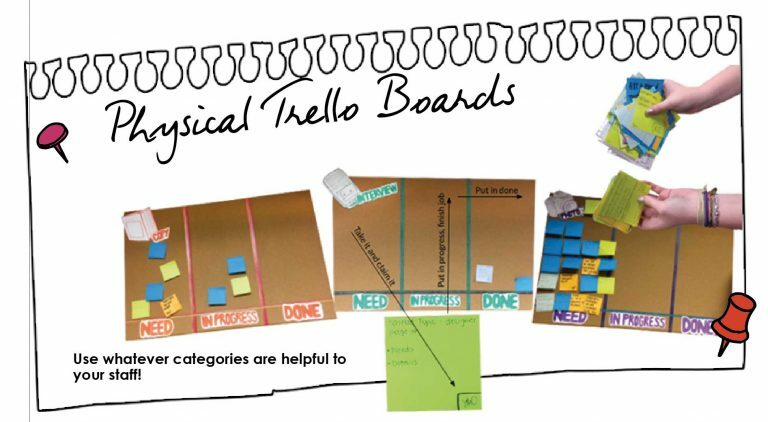 Our final resolution seemed obvious: an actual physical set of Trello boards. We could use the same model for organization that other staffs are using with the app, but the physical aspect of our creation would provide several benefits for Katie and me, and for the staff as a whole. Every yearbook staff is structured a little bit differently. Some staffs use teams and others use jobs. How you would make these Trello boards work for you and your staff depends on the way you structure your staff. I will explain our staff structure, and then you can decide how you could make this system work for you. We have specific positions on our staff – designers, writers, photographers and their respective section editors. We also have a senior ad team, but they don’t typically have a need for the Trello boards unless they have spare time and are able to help another staffer. On the first day of a new deadline, we have our Draft Day to assign spread topics to designers and writers. Emily Arnold wrote about her version of the draft day in the 2017 Fall Idea File issue. If you would like to know how that works, it can be found at walsworthyearbooks.com/ideafile. Then, our designers get straight to work. They are required to sketch out their design ideas for each of their spread topics. They have to make a list of any copy needs, photography needs, or infographic needs that they may have for the entire deadline. Now, of course, I always have to emphasize with them that it is OK for things to change during a deadline. Their needs may change, their design may change and their whole idea of coverage may change. Their final product does not have to match their original sketch. It is a first draft. It is a tool to help communicate to everyone on staff what they want the final product to look like. Once they have listed all of the needs they know they have, each of those needs becomes a Post-it ® for a Trello board; they write their specific need (e.g. a dominant photo of the JV pitcher releasing the ball or a featurette about John Smith, the only freshman on the varsity basketball team), they write the page number it will correspond to, and they write their name so anyone working on the task will know who to contact. Then, the sticky note gets placed on the “need” section of the corresponding Trello board. In order to create these boards, we purchased corkboards from the craft store, one for each “topic.” We have a board for copy, photography, interviews and proofs. The number of boards and their sizes depend on your needs, but ours are about 23” x 35”. We then divided each board into three sections, vertically. We used decorative Washi tape to give it a little flair. We have the “need” section, the “in progress” section and the “done” section. The “need” section is for anything the designers plan to have on their spreads that they will need help with. These are placed at the beginning of the deadline, as mentioned before, after the designers have sketched out their ideas. Then, there are the “in progress” and “done” sections. As the deadline continues, these sections begin to fill up. When someone is ready to begin a task listed in the “need” section of a board, they pick up the sticky note, put their initials in the corner, and place it in the “in progress” section so everyone else can see that it is being worked on. This is helpful for the staff because, from any point in the room, you can see how many sticky notes are still in the “need” section and haven’t been addressed. As an adviser, you know there is always one person who is “done with everything,” so now you can simply point to the interview board that has 12 sticky notes in the need column and have them work on getting interviews! You can walk up to any board and find out what a student is currently working on. If my photographer initials the sticky note for a dominant photo of a varsity basketball girl shooting a free throw and then moves it to the “in progress” section, I know he will be at the game getting that shot. The designer of the varsity basketball spread can see John’s initials on the original sticky note and can talk to him about any other details she thinks he may need. In addition, I can personally follow up with John if something goes wrong or the photos don’t get placed shortly after the game. It is an easy visual of how much work needs to be done, how many tasks are being worked on and how much of the work has already been completed and moved to the “done” section. Sticky notes do not get moved to the “done” section until they are absolutely complete and ready to be placed on a page. This means copy has been approved by the editor, photos have been edited or cut out, and interviews are complete and transcribed for the designer to access. When we are entering the week before deadline and we still have things listed in the need section, my EIC and I can easily identify what those things are and start assigning tasks to people so that we don’t end up sitting at our late night (just before deadline) wondering why so much isn’t done yet. Now, if I’m being completely honest, this system didn’t work out perfectly for us. It was our first attempt this year. In the beginning, it was helpful, but Katie and I got so overwhelmed with other tasks that we did not do a good job of staying on top of things and making sure the boards were kept up to date. When we started the school year, we had 11 staffers returning from the previous year. So when we introduced this idea, they liked it for the purpose of communication, but they didn’t like that they had to keep up with putting their sticky notes on the board and moving them to the correct sections. I think our mistake was trying to spring it on them all at once. This is something they didn’t have to do the year before, so it was new and unfamiliar. We will be entering a new year with only five returning staffers, so the majority of our yearbook staff will be new. We will have the opportunity to implement the Trello boards in an effective way that can help boost the communication among this new staff as they continue to get to know one another. Katie and I have also taken the time to critique ourselves and our use of the boards. We want to make sure we keep up with the boards more regularly so we can help everyone else learn the process and use the system in a way that can be helpful for each of them. Allison Miller has been the adviser of the Marauder yearbook and the Insight literary magazine at Marcus High School in Flower Mound, Texas, for three years. She has taught sessions at JEA and CSPA about both InDesign and yearbook organization. Each year, her students bring home state and national awards, ranging from Gold Circles to state IAAs and even UIL medals.